The 3rd The King’s Own Hussars can trace their history back to 1685 and shortly afterwards took the title ‘The Queen Consort’s Regiment of Dragoons’. In 1714 the title changed to the ‘King’s Own Regiment of Dragoons’ and in 1818 they became ‘3rd The King’s Own Light Dragoons’. In 1861 the title of the regiment changed to ‘The 3rd King’s Own Hussars’. In 1921 the regiment changed its title for the last time to become the ‘3rd The King’s Own Hussars’. From August 1940 to November 1941, the regiment saw active service in North Africa and Crete and in January 1942 B Squadron were sent to help stem the Japanese advance in the Far East. 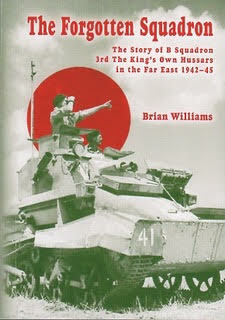 This book started out as an attempt to follow the history of one member of B Squadron, my late father-in-law, Alfred Hall. This led me into a search to try to find out as much as I could about the fate of the other members of B Squadron while in the Far East. It is hoped that this book will assist other amateur genealogists who wish to discover the part that their family played in the horrific events in the Far East from 1942 to the end of the war in 1945. In 1958 the regiment amalgamated with the 7th Queen’s Own Hussars, bringing to an end 273 years of unbroken service to the Crown.